The Cime was closed coming from my end – i.e. continuing counterclockwise – because of snow, but the other end was open. This made it a bit more difficult to ride, with traffic going both ways. At the summit, it was actually surprisingly busy, but the views are breathtaking, similar to the ones on the Galibier. The descend is not very technical, but I didn’t go down full speed – no need to increase the chance to crash. Still, it’s fun to go (that) fast in a not too difficult descend every now and then. We had lunch in a crowded Saint-Étienne-de-Tinée, after which I started the ascend from the south side. With just over 25 kilometers, this climb is actually around 2.5 kilometers longer than the one from the north, at a marginally lower average grade (6.6% against 6.9%). By the time I got past the former military settlements, going into the (wide) open area towards the summit, I was depleting my energy reserves faster than I could replenish them. 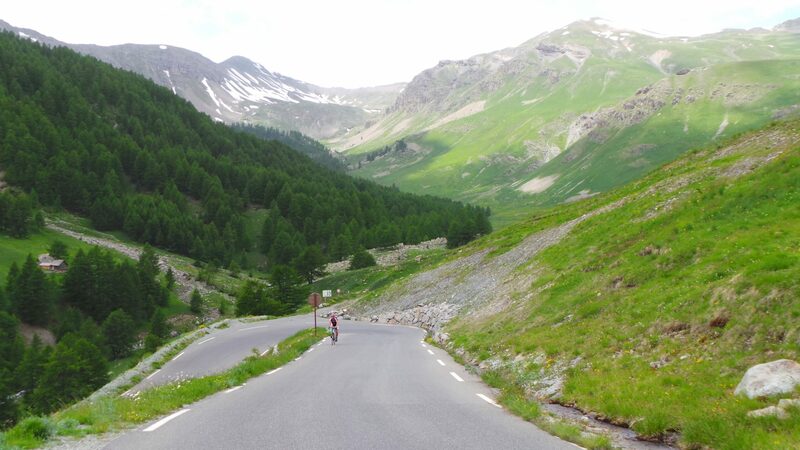 I didn’t have the energy left – nor did I feel the urge/need to do so, as I had already done it earlier – to cycle up the steep end of the Cime again. Trip: 96.3 km / 3,017 m elevation gain (Garmin).